Friends, it's time we sit down and have a little round table on this whole Elf on the Shelf thing. I mean. I get it. 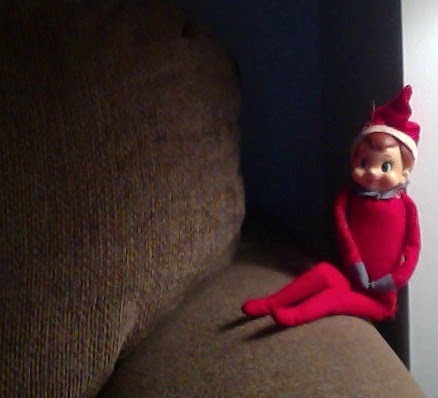 I get the whole, "Mr. Elf is Santa's helper and he keeps an eye on you during the month before Christmas." Or, as I like to see it, "A stuffed doll that comes to life under the pretense of being Santa's helper that keeps an eye on kids with questionable behavior during the crucial month prior to Christmas (in which it is determined whether one will be on the Naughty or Nice list) in an act of holiday espionage." And hear me out: I am in no way judging anyone who engages in this holiday tradition. (Or those who utilize subversive forms of behavior modifcation.) You know how I roll on the whole "judgement" thing. I know SO many kids who look forward to the return of their elf and the various acts of vandalism that accompany him or her. I also realize that coming up with the fun nightly tableaus is part of the fun for parents. 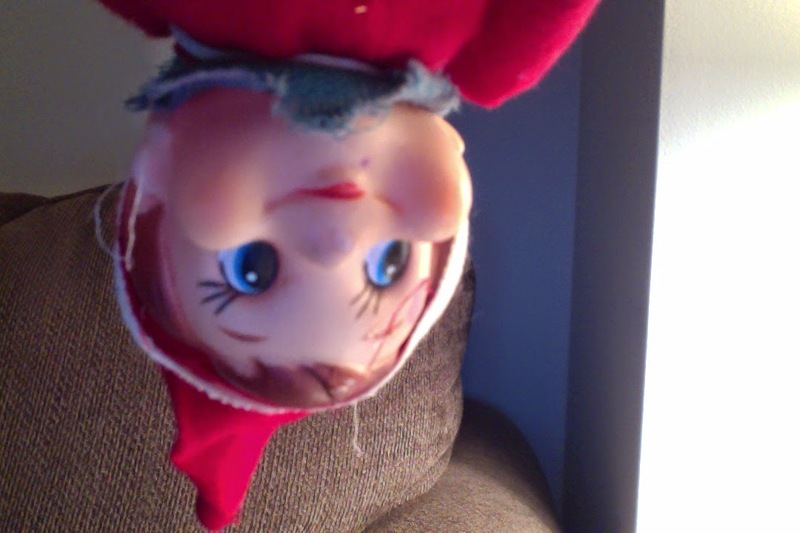 So, no, I don't disagree with Elf on the Shelf. Like I said, I just don't get it. I don't think Elf on the Shelf existed back then, but our ragamuffin doll is clearly a predecessor. We did make a meager attempt last year to do the elf thing. But it was a half-hearted effort that really just placated Hubby's interest in creating funny situations to put our elf in so the girls could find him in the morning. It lasted all of 3 days until we all forgot about it. What overwhelms me, though, is that each year Elf on the Shelf becomes more and more elaborate than the last. First, it was enough just to have an elf. Then, the elf had to do things, like move around at night and end up in a different spot than it was left the night before. Soon, the elf took on a mischievous streak, causing havoc all over the house (make sure to seal your flour tight lest you end up with a kitchen full of "snow!"). This year I'm seeing that the elf brings a welcoming gift. I'll be honest: I just can't keep up. First, I'm lucky if I remember to brush my teeth on a regular basis, let alone move a stuffed doll around my house each night. Second, the amount of creativity I possess fits into the nail on my pinkie finger. I would be lost setting up elaborate prankish scenes day after day. 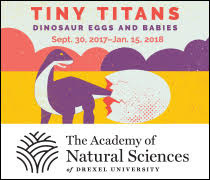 And friends? The gift giving at Christmas can be overwhelming as it is. The idea of providing gifts for an elf to leave? Where does it end?! Next year, the elf will be cooking the Thanksgiving turkey or handing out candy on Halloween. Perhaps he'll be the mailman to deliver my Valentine's to me on the most romantic day of the year (thanks, Hallmark!). And for every post I see of a parent sharing the fun and joy of Elf on the Shelf, I read 3 grumbling posts of parents complaining and loathing. "Ug! I have to move that damn elf again!" and "Shoot. I forgot to move the elf. Think the kids will remember?" and "For all that is sacred and holy, I can't think of another crazy thing for this elf to do tonight." For many, it seems as though our culture has all but forced the Elf hand, giving parents no option but to embrace this growingly complicated tradition. It's the Elf Firm. Is there no way out, friends? I'm not a curmugeon. Really. I'm just uncreative and somewhat lazy. 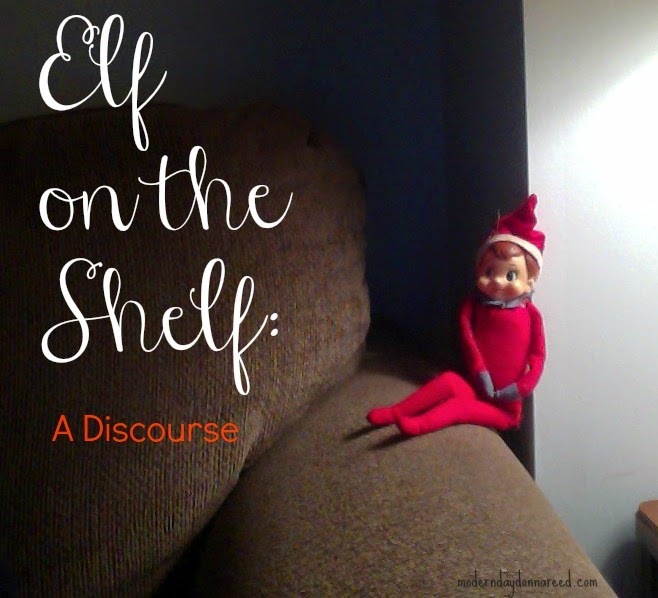 Why do you participate in Elf on the Shelf? Is it fun? Is it tradition? Is it out of coercion? To implement behavior modification? why do you choose to opt out? I look forward to your commentary and learning from the collective elf experiences of the masses.